There is a story behind this quilt rack that shows how far Clayborne’s will go to help out a customer. We had a customer that asked about a specific quilt rack they had seen someplace and wanted something similar, but they didn’t have any kind of picture or anything. After listening to the customer’s needs, our webmaster drew a picture of what he thought the customer was looking for, and took the liberty of adding a few things, like the heart cutout in the middle. After scanning and E-mailing the drawing to the customer it was determined to be exactly what he was looking for, so Roger took the drawing to one of our Amish builders. What you see here is a result of that drawing - Roger had several of them made and they have turned out to be quite popular. The webmaster is still impressed at how close this looks to his cheesy little pencil sketch. 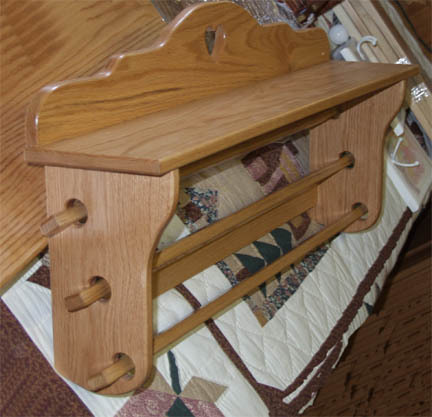 The quilt rack is made from solid oak, and is designed to hang on the wall. It is about 30” wide and about 20” tall top to bottom rail. It can display 3 quilts, showing about 5” of each quilt, and the quilt rods are staggered and spaced so the quilts fit. The sturdy shelf at the top is about 8” deep, and we added a decorative heart in the middle just because they seem popular these days. This one is shown in light oak, but we can have one finished to your wishes.